Barracuda | The Best Cast Net for the Money? The answer is simple. If you're looking to buy a new cast net and you want the best, then Barracuda is your brand. You'll find them for sale in the best pro tackle and bait shops, and you'll also find them being used daily by the pros. Full time charter captains spend every morning cast net fishing for the day's bait. Why do these professional guides throw Barracuda cast nets? The quality of the craftsmanship they know is going to last and the performance they get from a perfectly balanced net. You won't save much money on a cheap net from Walmart, Amazon or Ebay. Especially when you have to replace it so often and it only opens half the time. When it really comes down to it, and you need a cast net that's going to pop open, sink fast and catch that precious bait for the day. The pro's choice is Barracuda. If you're a beginner and just starting out, you might as well buy what the professional anglers are using. The Best Cast Net Size: This depends on whether you're just starting out, or have been throwing for a while. If you've never thrown one before, then an 8 foot net is the place to start. Smaller nets like 6 feet are good for throwing out of kayaks or if you're wade fishing. Below are some throwing instructions for 8, 10 and 12 footers. The size of the net is measured in how tall it is when held up or the radius when open. Thus an 8 foot net will cover 16 feet of water when opened. After you're consistently getting the 8 footer to open, then it's time to step it up if you want to catch more bait per throw. Most anglers go to a 10 footer next. This is where most seasoned net throwers are most comfortable. 12 foot nets are typically found on professional vessels. These guys have been doing it a while and probably throw it every day if they pack a 12 footer. The Best Mesh Size: Now that you've chosen the right size net for your level of throwing experience, you'll need to figure out your proper mesh size. This primarily depends on two factors; the depth you plan to cast in, and the size of the bait. Luckily these two tend to go hand in hand. For shallow water applications of 3 feet or less, you'll want to go with a 1/4 mesh. This is for targeting shrimp and small minnows, usually off the beach. The smaller the mesh size, the slower it will sink. If you throw a 1/4 mesh in 6 feet of water it will sink to the bottom too slowly and your bait will swim out from under it. When casting in 3 to 6 feet of water, a 3/8 inch mesh is the size for you. This is the most popular mesh size on the Boca Coast because we target White Bait, Green Backs, Pilchards, Herring, Scaled Sardines, Pin Fish, etc. The 3/8" mesh works the best here because it sinks fast, it can be used in deeper water and it also works well in shallow water. In the winter time, the bait tends to be in deeper water. When casting into 6 to 15 feet of water, you'll want to throw a 1/2 inch mesh. This is where the size of the bait vs mesh can become an issue. If the bait is too small for your 1/2" mesh, you'll end up with what's known as a Christmas tree. This is when your mesh is too big and the bait gets gilled or caught up in the mesh. You can pick them out one by one or scrape them off with your bait well net, but it's unlikely that any will survive. This is when you'll want to chum them up to the surface so you can deploy your 3/8". If you're catching very large bait near a bridge or structure, then you may be casting in 8 to 20 feet of water. A 5/8 inch mesh will get the net down to the bottom quickly, but you may also have issues with gilling bait at times. It depends on your target species. This may also call for chumming them up into the water column in order to cast a smaller meshed net. If you're targeting large bait like Mullet, then 1 inch mesh is appropriate because it will sink very fast and the bait is big enough that you won't have concern about it getting gilled up in mesh of the net. How To Throw An 8 to 10 Foot Cast Net: There are several methods of throwing a cast net. When you're a beginner and first starting out, the 8 foot net is the easiest to throw. Throwing a 10 footer is very similar and you can throw both with this method. Best part is you don't use your teeth or put a wet net on your shoulder! This is the dry method and our personal favorite! How To Throw A 12 Foot Cast Net: When you're ready to join the "One & Done" club with the pros, here's Captain Blair Wiggins from TV's Addictive Fishing showing his technique for tossing the big nets. Where & How To Chum: Depending on the time of year and water temperature, you may be anywhere from the beach to a flat or even a bridge looking for bait. Visit our page about Chum and learn all about the techniques and locations for finding bait and chumming it up to the surface for cast netting. Why Barracuda: The build quality, materials, design and performance are the best. Ask anyone who has experience with other nets and you'll probably hear how the Barracuda nets POP open. Other nets sound like a band-aid being pulled apart and you can hear the difference in sound when you're out on a flat pre-dawn. That's because they use a large 3.25”, 4 section, custom built horn (at the top). The larger horn allows the braille lines to travel through it faster with less resistance. The sections keep the braille lines from getting tangled in the net which solves a common and annoying issue with the cheap ones. Their mesh is a proprietary monofilament that exclusive to Barracuda. It has exceptional strength, durability and flexibility. Most importantly; it has a faster sink rate. For example; their Pro nets weighing in at 1.4 lb per foot, actually sink faster than other brand's nets with 1.5 lb per foot. They're constructed of a 6-panel mesh which allows for a better spread and opening. And Finally; round leads sink fast, retain bait because they don't plane and also reduce snags. Also be sure to register your new net on their website, because they come with a Limited Lifetime Warranty! That's right, if your Barracuda gets ripped, torn or destroyed, you can turn it in for a new one at 50% off MSRP. No other manufacturer offers that and you just can't beat it! Conclusion: Read the reviews, talk to charter captains and go check out the cast nets at your local bait & tackle store. Hold a Barracuda in your hands and compare it to any other brand. Notice how soft and limp the Barracudas are. That's the one you want. 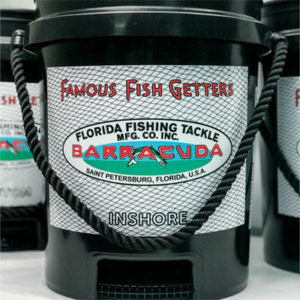 You'll soon learn Barracuda is the first choice in cast nets and why they're official cast nets of the Boca Coast. If you're in the market to buy a new cast net for catching bait, then hopefully this page has helped you figure out what brand and size to buy. Most of our pro anglers and guides throw a 3/8" mesh net in shallow water during the majority of the year. A 1/4" is good for a couple months in summer when the baits get small. Many also have a 1/2 inch mesh in their arsenal for winter and deep water netting. Learning how to throw the net and chum up the bait will improve your catch rate tremendously. The Boca Coast is the Inshore Fishing Capital of the World and the white bait (pilchards) is the go to bait for lunker snook, redfish and tarpon. Ask any professional angler and they'll tell you that nothing beats live bait if you want to catch fish. Getting out there and catching your own bait is both rewarding and fun. It adds another aspect of fishing to your day that you'll certainly enjoy and soon learn improves your angling experience. Tight Lines & Full Nets friends!